You have 4 TVs in your house. One TV is in the living room. It has a Comcast set-top box + DVR combo unit working with it. You need to pay $18 monthly rental fee on this unit. One TV is in the bedroom. You have a Comcast set-top box and a TiVo connected to it. The monthly rental fee on the set-top box is $6. The monthly service fee of using TiVo is $12.95. One TV is in your kid’s room. He has a Comcast set-top box in his room. The monthly rental fee is $6. One TV is in the kitchen. It only has basic cable on it. With the BOCS installed, you can get rid of the A/V equipment in the bedroom and your kid’s room. The annual saving is ($6 + $12.95 + $6) X 12 = $300! And, now you can watch your DVR recording in your kitchen, too. 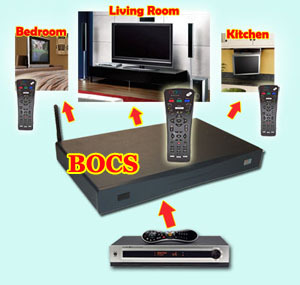 Click Here to go to the BOCS product page.